The total eclipse of August 21 is rightfully attracting huge attention. Towns along the totality band will be flooded with people anxious to experience this rare event. Most of us, wearing our eclipse-safe glasses, will be looking upward to watch the complex but short-lived changes in the sun as the moon passes over. But you should consider getting close to some trees and looking down. As the sun filters through a tree canopy, the little gaps between the leaves act like thousands of pinhole cameras. The result is what you see in the picture to the right. 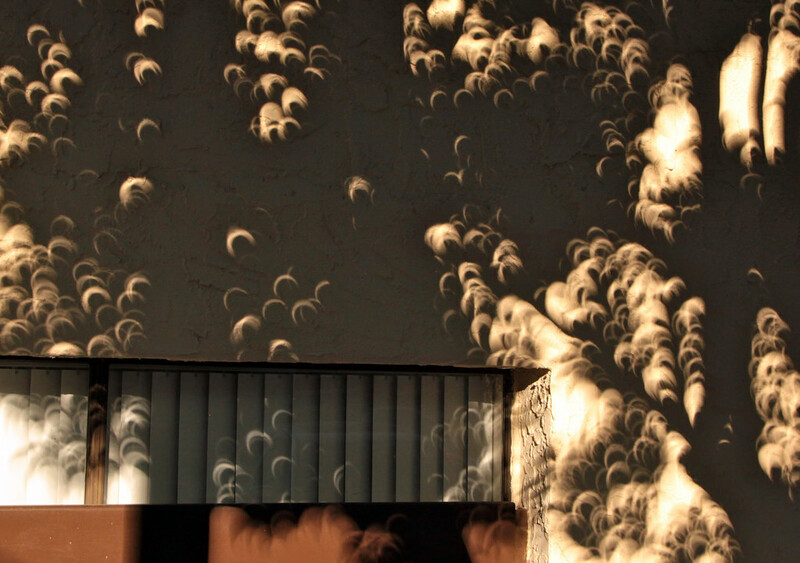 As the moon crosses the sun, you will see crescent-shaped spots on the ground or on nearby walls. If the day is breezy, these crescents will dance across the landscape, creating a magic effect. As the eclipse approaches totality, the crescents will become smaller and overlap less. During totality there will be no crescents but they will quickly reappear. The good thing about watching the sun crescents on the ground is that it is entirely safe as long as you don't stare up into the canopy. At the moment of totality, when the sun goes completely dark and the dapples disappear, it is safe to look up for a minute. This provides a convenient and safe alternative to making pinholes on cardboard or other ways of viewing the eclipse. It may be tempting to photograph the eclipse itself, but there is almost no way you can duplicate the work of the many thousands of professional photographers who will be out there. You can, however, get great and unique photos of the sun dapples on the ground. So, give it a try. And at the moment of totality, put your cell phone away and just enjoy the splendor of a total eclipse. Be safe, follow the rules, and happy eclipsing! Posted in News and tagged canopy gaps, eclipse, Trees.